If you live in Portland, Oregon then you know how much it rains. Our climate is great if you love to see green all year round however it is also the perfect atmosphere for moss to grow. It may look like a harmless, even pretty plant and in the right areas it is. But moss is absolutely terrible to have growing on your roof! Why is Moss On My Roof Bad? Many wonder about this. Sure, having on on your roof might not be so pretty but is there more to it then that? Well, in the spirit of being entirely honest, yes there is. Once moss plants itself on your roof it will start to grow rather rapidly and it tends to spread across your entire roof. As it grows, it likes to make sure it stays there. It does that by getting under the shingles on your roof. Why is that a bad thing? As rain falls moss collects it like a sponge. When the weather outside gets cold enough to freeze, the water in the moss expands. As it expands, it lifts up the shingle that it manage to attach itself to. Then, when it iss warm enough, it thaws and goes back to normal. With our weather here in Portland, the freeze and thaw is daily in the colder months. That action, when it is continuous as it is here, will literally loosen the shingle! Then come one blustery day and you can say bye bye to that healthy roof and lose those shingles. Do You Need Moss Removal or Gutter Cleaning on Your Home? If you have moss on your roof, chances are you need to get it take care of. However, we understand that it might not be in your budget at the moment. 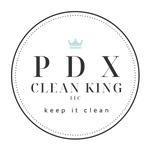 With PDX Clean King, we can give you a FREE Estimate so that you can know just how much it will cost you and, if need be, you can budget that into your needs a little later. Clogged Gutters are another problem that we tend to have here. If you think that they need to get cleaned out but aren’t sure, just let us know and we can add that to your estimate. Our number one concern at PDX Clean King is that you are treated right and well taken care of. We’re here to help so if you need your roof cleaned. Choose us! You’ll be happy you did. Click HERE to contact us today and schedule your FREE Estimate!